Our farm is at Ahuroa and can be approached on tar seal from Hwy 1 or Hwy 16, or by unsealed road from Hwy 1 via Puhoi. 1) From Hwy 1 at Warkworth 13k along Woodcocks Rd which becomes West Coast Rd. Do NOT turn right or left, cross the railway tracks, over the hill to the one lane bridge just before Ahuroa Rd joins you from the left. Go past Ahuroa Rd and we are about 200m on. The red woolshed is on your left with the Rancho Radiata sign at the gate. 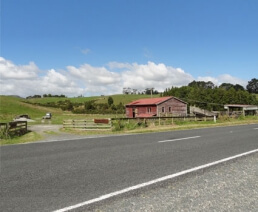 2) From Hwy 16 north of Kaukapakapa take West Coast Rd for 11k towards Warkworth. You pass Hawkens Rd on your right and about one hundred metres further on you will see the red woolshed on your right with the Rancho Radiata sign at the gate. 3) From Hwy 1 via Puhoi follow Ahuroa Rd. About 14km of mainly unsealed road to Ahuroa School. 1km further to a T junction with West Coast Rd. Turn left and our red woolshed is on the left in 200 metres.